7 inches by 7 inches. 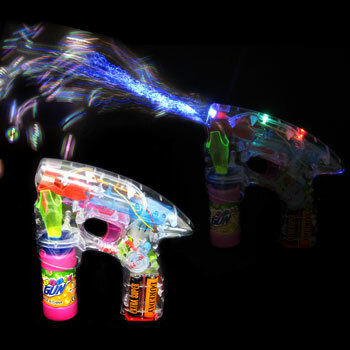 Both kids and adults will love playing inside or outside with this awesome transparent bubble gun. Gun lights up when the lever is pulled. Looks really cool in a darkened room! To refill just add more bubble solution to the attachable bottle. Requires 3 “AA” batteries which are included. Sold by the each. $3.85 each for 36 or more.